June 15 Sunday Cold & unpleasant, raining by spells most of day, quite muddy Mer 65°+ about noon, & only 66°+ at 2 o,c, Ellery & I attended funeral services of Mrs. Plank, at A.P. church (at 10 o,c,) which was more than filled, no services at the other churches. I spent most of P.M. & eve reading. 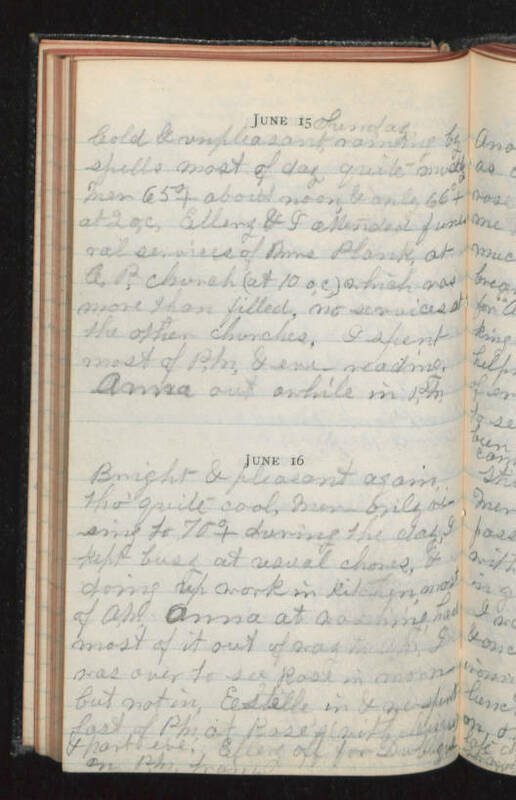 Anna out awhile in P.M. June 16 Bright & pleasant again tho' quite cool, Mer only rising to 70°+ during the day, I kept busy at usual chores, & doing up work in kitchen, most of A.M. Anna at washing had most of it out of way in A.M. I was over to see Rose in morn but not in, Estelle in & we spent last of P.M. at Rose's (with Lena) & part eve. Ellery off for Dubuque on P.M. train.